Come and enjoy this beautiful land. Both are zones with a rich variety of natural areas, a paradise for birdwatching and all kind of outdoor activities. And both are located near the Monfrague National Park. All this zone is made of agricultural lands and natural landscapes, together with plains, wetlands and reservoirs. 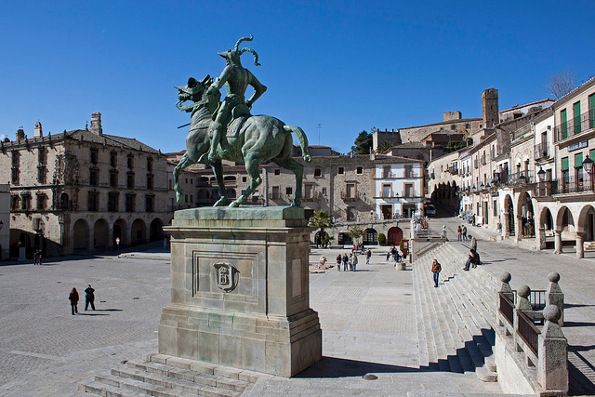 The city of Trujillo is one of the most important historical cities of Extremadura. Its castle, the walled enclosure and the main square (Plaza Mayor) are impresive and can transport the visitor back in time to past epochs. Trujillo celebrates in Easter a feast called Chiviri: the people dressed with typical costumes with red shawls on the neck and dance popular songs all the day. Also the International Cheese Fair takes place in Trujillo in late April. ancient monuments, culture and tratidions preserved for centuries, nature, rivers, mountains, dehesas.. zones for birdwatching, for hicking or simply for relax.